Caldera | Beer Apprentice - Craft Beer News, Reviews, Interviews and Info. Hey guys!!! Time for another craft beer review. Today, I’m taking a chance with a beer and a brewery that I’ve never tried before nor have I heard much about. I just saw this sitting on the shelf of my beer shop and decided to give it a go. 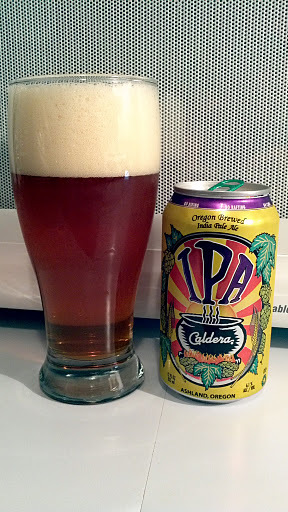 It’s the Caldera IPA produced by the Caldera Brewing Company located in Ashland, Oregon. Let’s see what we can find out about it from the brewery’s website, calderabrewing.com. An American-style India Pale Ale brewed with plenty of body and an assertive hop profile. Ok….. not much to go on there. This brew has an ABV of 6.1% and it came in a 12 oz. can. The beer poured a clear amber to orange color with some burnt orange highlights making themselves known at the bottom of the glass. The head was wonderfully sized, off white, fluffy, soapy and soft. The retention was pretty good and the lacing was great. The taste lets the grapefruit shine. Way more was noticed in the taste than was in the aroma. Tons of bitterness and bite with this brew. I looked on the website and noticed the the IBU’s were rated at 94. No wonder this thing kicks!!! The hops really push this beer along and dominate the flavor. I was able to discern a small amount of bread and caramel sweetness though. I found it hiding way back in the corner just waiting to be discovered. Make no mistake about it though. The hops are what define this beer. The mouthfeel was medium, not terribly dry, crisp, very refreshing and thirst quenching. Tons of bitterness and flavor coat the sides of the tongue and roof of the mouth. It actually became a little bit watery towards the end of the drink. Man, this is a very nice brew. I’m so glad I took the chance and picked this up. I want another one for sure. It’s super easy to drink, perfect for warm or crisp weather and it comes in cans. Thus, making it perfect for transport when tailgating or taking to a get together. It’s a winner all the way around. Some may be turned off by the extreme bitterness left behind, but I found it quite enjoyable. So…. give it a try and see if you find it as nice as I did. What’s the best “canned” beer on the market in your opinion? Is the Caldera IPA worth a vote?